Come and experience the magic of Christmas at Aldryngton Primary School PTA Christmas Fayre, Saturday 1st December, 12pm – 3pm. Book online to visit Santa in his Grotto. The online booking system will be live from 10am on Monday 26th November 18 and will close at 2pm on Wednesday 28th November 18. Bookings made before 10am on 26th November 18 will not be accepted. It wouldn’t be Christmas without a visit to Father Christmas, Fayre doors open 12pm, Santa will make his Grand Entrance into the school hall at 12.05pm where you can welcome him and lead him to his Grotto. Each paying child will receive a gift from Santa. 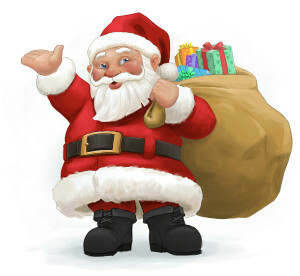 You can pre book a visit to Santa (up to 3 children per timeslot). Choose an available timeslot for the child/ren you are booking for, one timeslot for up to 3 children (availability is limited so we ask that siblings visit Santa together so that other children don’t have to miss out). Click on the Booking Link below to start your booking. If you are not successful in pre booking a visit to Father Christmas, there will be some spaces available on the day, bookable at the Grotto from 12pm and allocated on a first come basis. The online booking system will be live from 10am on Monday 26th November and will close 2pm Wednesday 28th November. Bookings made before 10am on 26th November will not be accepted. Please arrive at the grotto five minutes before your allotted time as unfortunately it will not be possible to fit in any late comers due to Santa’s hectic schedule! If you have any queries you can contact Santa’s elves on santa@aldryngtonpta.com.